In her essay "Character in Fiction," Virginia Woolf grandly declared "that on or about December 1910 human nature changed." She was being only a little ironic. The seemingly arbitrary date was an allusion to the first exhibition of postimpressionist paintings. Paul Cezanne was the star of the show. His revolutionary pictures were mostly of modest things: fruit, skulls, the parched Provencal landscape. These humble subjects only highlighted Cezanne's painterly form, his blatant abandonment of what Roger Fry, in his introduction to the exhibit, called "the cliché of representation." No longer, Fry declared, would "art aim at a pseudo-scientific fidelity to appearance. This is the revolution that Cezanne has inaugurated... His paintings aim not at illusion or abstraction, but at reality." It is not easy to change the definition of reality. At the 1910 exhibition, Cezanne's paintings were denounced in the press as "being of no interest except for the student of pathology and the specialist in abnormality." Cezanne, the critics declared, was literally insane. His art was nothing more than an ugly untruth, a deliberate distortion of nature. The academic style of painting, with its emphasis on accurate details and fine-grained verisimilitude, refused to fade away. This conservative aesthetic had scientific roots. The psychology of the time continued to see our senses as perfect reflections of the outside world. The eye was like a camera: it collected pixels of light and sent them passively on to the brain. The founder of this psychology was the eminent experimentalist William Wundt, who insisted that every sensation could be broken down into its simpler sense data. Science could peel back the layers of consciousness and reveal the honest stimuli underneath. Cezanne inverted this view of vision. His paintings were about the subjectivity of sight, the illusion of surfaces. Cezanne invented postimpressionism because the impressionists just weren't strange enough. "What I am trying to translate," Cezanne said, "is more mysterious; it is entwined in the very roots of being." Monet and Renoir and Degas believed that sight was simply the sum of its light. In their pretty paintings they wanted to describe the fleeting photons absorbed by the eye, to describe nature entirely in terms of its illumination. But Cezanne believed that light was only the beginning of seeing. "The eye is not enough," he declared. "One needs to think as well." Cezanne's epiphany was that our impressions require interpretation; to look is to create what you see. We now know that Cezanne was right. Our vision begins with photons, but this is only the beginning. Whenever we open our eyes, the brain engages in an act of astonishing imagination, as it transforms the residues of light into a world of form and space that we can understand. By probing inside the skull, scientists can see how our sensations are created, how the cells of the visual cortex silently construct sight. Reality is not out there waiting to be witnessed; reality is made by the mind. Cezanne's art exposes the process of seeing. Although his paint­ngs were criticized for being unnecessarily abstract — even the impressionists ridiculed his technique — they actually show us the world as it first appears to the brain. A Cezanne picture has no boundaries or stark black lines separating one thing from the next. Instead, there are only strokes of paint, and places on the canvas where one color, knotted on the surface, seems to change into another color. This is the start of vision: it is what reality looks like be­ore it has been resolved by the brain. The light has not yet been made into form. But Cezanne did not stop there. That would have been too easy. Even as his art celebrates its strangeness, it remains loyal to what it represents. As a result, we can always recognize Cezanne's subjects. Because he gives the brain just enough information, viewers are able to decipher his paintings and rescue the picture from the edge of obscurity. (His forms might be fragile, but they are never incoherent.) The layers of brushstrokes, so precise in their ambiguity, become a bowl of peaches, or a granite mountain, or a self-portrait. This is Cezanne's genius: he forces us to see, in the same static canvas, the beginning and the end of our sight. What starts as an abstract mosaic of color becomes a realistic description. The painting emerges, not from the paint or the light, but from somewhere inside our mind. We have entered into the work of art: its strangeness is our own. Cezanne never lived to see culture and science catch up with his avant-garde. He was a postimpressionist before impressionism was fully accepted. But for Fry and Woolf, Cezanne's style seemed prophetically modern. In the autumn of 1912, six years after Cezanne died alone in Provence, Fry mounted the second postimpressionist exhibition at the Grafton Gallery. Cezanne's paintings were now seen as the start of a serious movement; his artistic experiments were no longer lonely. The white walls also displayed canvases by Matisse; the New Russians; and Virginia's sister, Vanessa Bell. Abstraction had become the new realism. The story of abstract painting begins with the photograph, which literally means "light writing." That's what a photograph is: an image written in frozen light. Ever since the Renaissance, artists have used camera obscuras ("dark rooms") to condense the three planes of reality into two dimensions. Leonardo da Vinci described the instrument in his notebooks as a metaphor for the eye. Giovanni Battista Delia Porta, in his 1558 treatise Magia Naturalis (Natural Magic), advocated the camera as a tool for struggling painters. But it wasn't until the nineteenth century, with the discovery of photosensitive chemicals, that painting lost its monopoly on representation. Verisimilitude was now a technology. Louis Daguerre, a commercial painter, was the inventor of the photographic plate. By treating silver-coated copper sheets with iodine, Daguerre created a flat surface sensitive to light. He then exposed these plates in a primitive camera (a black box with a hole) and developed the images with the warm poison of mercury vapor. The pixels emerged like accurate ghosts. By immersing the plate in a salt solution, Daguerre made the ghosts permanent. Light had been captured. Painters, still in the business of copying reality, saw the new tech­nology as a dire threat. How could the human hand compete with the photon? J.M.W. Turner is said to have remarked after seeing a daguerreotype that he was glad he'd already had his day, since the era of painting was now over. But not all artists believed in the inevitable triumph of the camera. The symbolist poet Charles Baudelaire, a natural skeptic of science, reviewed a photographic exhibition in 1859 by proclaiming the limits of the new medium. Its accuracy, he said, is deceptive, nothing more than phony simulacra of what was really out there. The photographer was even — and Baudelaire only used this insult in matters of grave import — a materialist. In Baudelaire's romantic view, the true duty of photography was "to be the servant of the sciences and arts, but the very humble servant, like printing or shorthand, which have neither created nor supplemented literature.... If it [photography] is allowed to encroach upon the domain of the imaginary, upon anything whose value depends solely upon the addition of something of a man's soul, then it will be so much the worse for us." Baudelaire wanted the modern artist to describe everything that the photograph ignored: "the transient, the fleeting, the contingent." Inspired by Baudelaire's writings and the provocative realism of Edouard Manet, a motley group of young French painters decided to rebel. The camera, they believed, was a liar. Its precision was false. Why? Because reality did not consist of static images. Because the camera stops time, which cannot be stopped; because it renders everything in focus, when everything is never in focus. Because the eye is not a lens, and the brain is not a machine. These rebels called themselves the impressionists. Like the film in a camera, their idiom was light. But the impressionists realized that light was both a dot and a blur. If the camera captured the dot, the impressionists represented the blur. They wanted to capture time in their paintings, showing how a bale of hay changes in the afternoon shadows, or how the smoke of a train leaving Gare Saint-Lazare slowly fades into thin air. As Baudelaire insisted, they painted what the camera left out. 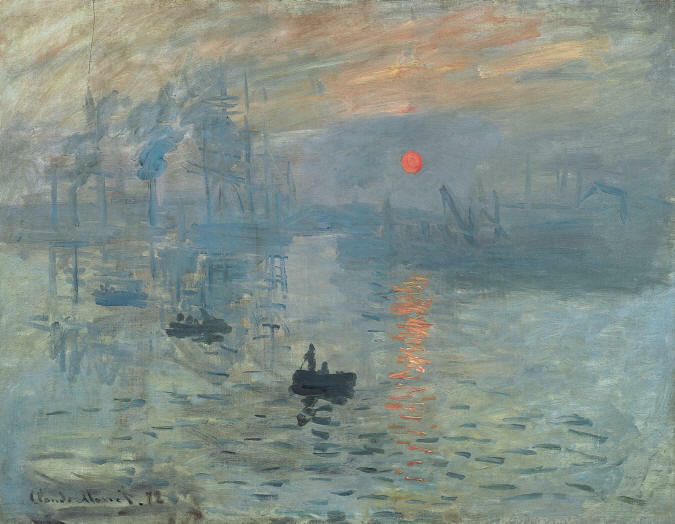 Look, for example, at an early Monet, Impression: Soleil Levant (Impression: Sunrise). Monet painted this hazy scene of the Le Havre harbor in the spring of 1872. An orange sun hangs in a gray sky; a lonely fisherman sails in a sea made of undulating brushstrokes. There is little here for the eye to see. Monet is not interested in the ships, or in their billowing sails, or in the glassy water. He ignores all the static things a photograph would detect. Instead, Monet is interested in the moment, in its transience, in his impression of its transience. His mood is mixed in with the paint, his subjectivity muddled with the facts of his sensations. This, he seems to be saying, is a scene no photograph could catch. With time, the impressionists grew more radical. This was partly due to eye troubles: Monet became blind (but didn't stop painting the bridges of Giverny). Vincent van Gogh, drinker of kerosene, turpentine, and absinthe, probably thought the coronas he painted around stars and streetlamps were real. Edgar Degas became severely myopic, which led him to do more and more sculpture ("I must learn a blind man's trade now," Degas said). Auguste Renoir, poisoned by his pastel paints, became a rheumatic cripple. But whether their abstraction was motivated by physiology or philosophy, it became increasingly clear that the impressionists had broken with the staid traditions of academic realism. They didn't paint religious heroes or epic battles or portraits of the royal family. Instead, they continued to paint what they had always painted: the Sunday picnics of the bourgeoisie and women in bathtubs and purple lilies floating on light-dappled water. When the critics ridiculed their work as frivolous and false, they just shrugged. After all, the impressionist art was a celebration of technique; wherever there was light, they could create paintings. This is why the impressionists feel modern, while Delacroix and Ingres and Bouguereau do not: they realized the painter did not simply have a subject that he or she was duty bound to represent. The painter was an artist, and artists had ideas that they were com­pelled to express. In their unsellable canvases — the Louvre wouldn't even accept them as gifts — the impressionists invented the idea of painterly abstraction. Color became symbolic. Blurriness was chic. The gaze was out, the glance was in. But the thing about art movements is that they are always moving. By freeing the artist from the strict limits of verisimilitude, impressionism was destined go places those water lilies could never have imagined. And if Monet and Degas, prodded by the camera, led the way into impressionism, Paul Cezanne led the way into its aftermath. As he immodestly declared at the beginning of his career, "I want to make of impressionism something solid and lasting, like the art in the museums." Cezanne often spent hours contemplating a brushstroke. Out in the open air, he would stare at his subject until it melted under his gaze, until the forms of the world had decayed into a formless mess. By making his vision disintegrate, Cezanne was trying to return to the start of sight, to become nothing but "a sensitive recording plate." The slowness of this method forced Cezanne to focus on simple things, like a few red apples set on a trapezoid of table, or a single mountain seen from afar. But he knew that the subject itself was irrelevant. Stare hard enough, his paintings implore, and the laws of the known universe will emerge from just about anything. "With an apple," Cezanne once said, "I will astonish Paris." The founder of postimpressionism learned to paint from a quintessential impressionist: Camille Pissarro. The two made an incongruous pair. Pissarro was a French Creole Jew from the West Indies, while Cezanne was a coarse — some said crude — Provencal. Their friendship was founded upon their shared sense of isolation. Both were exiles from the academic style of the time, which had made Ingres into a god and talent synonymous with fine-grained resolution. Pissarro and Cezanne had neither the temperament nor the patience for such art. Pissarro was a friendly anarchist and recommended burning down the Louvre, while Cezanne — speaking of his early painting instructors — declared, "Teachers are all castrated bastards and assholes. They have no guts." Alone together, Pissarro and Cezanne saturated themselves in their own style. Cezanne would methodically copy Pissarro's paintings in order to understand his impressionist technique. "The eye must absorb everything," Pissarro instructed him. "Do not follow rules and principles, but paint what you see and feel. And do not be shy of nature." Cezanne listened to Pissarro. Before long, the burnt umbers and mahoganies of Cezanne's early paintings (he loved Courbet) had become the layers of pastel typical of impressionism. An early work, Rocks at L'Estaque, depicting Cezanne's favorite Provencal landscape, clearly demonstrates Pissarro's influence. Staccato brushstrokes predominate; the colors are basic but exist in myriad tones. Depth and structure, even the time of day: all are de­fined by minute differentiations in the tint of paint. 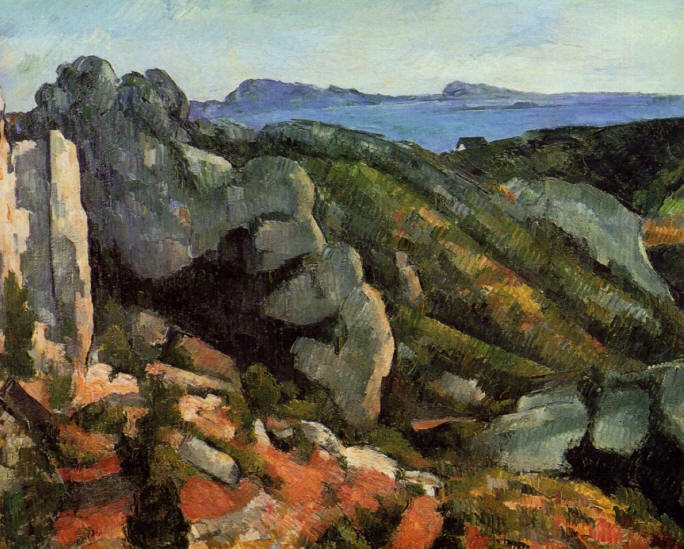 But Rocks at L'Estaque, for all its impressionist splendor, also shows Cezanne inventing his own avant-garde. This is because Cezanne had stopped worshipping light. He found the impressionist project — the description of light's dance upon the eye — too insubstantial. ("Monet is only an eye," Cezanne once said, with more than a little condescension.) In the Rocks at L'Estaque, the sea in the distance does not sparkle as Pissarro would have had it sparkle. The granite does not glint in the sunshine, and nothing casts a shadow. Cezanne was not interested, as the impressionists were, in reducing everything to surfaces of light. He had stopped arguing with the camera. Instead, in his postimpressionist paintings he wanted to reveal how the moment is more than its light. If the impressionists reflected the eye, Cezanne's art was a mirror held up to the mind. What did he see in the mirror? Cezanne discovered that visual forms — the apple in a still life or the mountain in a landscape — are mental inventions that we unconsciously impose onto our sensations. "I tried to copy nature," Cezanne confessed, "but I couldn't. I searched, turned, looked at it from every direction, but in vain." No matter how hard he tried, Cezanne couldn't escape the sly inter­pretations of his brain. In his abstract paintings, Cezanne wanted to reveal this psychological process, to make us aware of the particular way the mind creates reality. His art shows us what we cannot see, which is how we see. Understanding how sight starts, how the eyeball transforms light into an electrical code, is one of the most satisfying discoveries of modern neuroscience. No other sense has been so dissected. We now know that vision begins with an atomic disturbance. Particles of light alter the delicate molecular structure of the receptors in the retina. This cellular shudder triggers a chain reaction that ends with a flash of voltage. The photon's energy has become information. But that code of light, as Cezanne knew, is just the start of seeing. If sight were simply the retina's photoreceptors, then Cezanne's canvases would be nothing but masses of indistinct color. His Provencal landscapes would consist of meaningless alternations of olive and ocher, and his still lifes would be all paint and no fruit. Our world would be formless. Instead, in our evolved system, the eye­ball's map of light is transformed again and again until, milliseconds later, the canvas's description enters our consciousness. Amid the swirl of color, we see the apple. What happens during this blink of unconscious activity? The first scientific glimpse into how the brain processes the eye's data arrived in the late 1950s, in an astonishing set of experiments by David Hubel and Torsten Wiesel. At the time, neuroscience had no idea what kind of visual stimuli the cortex responded to. Light excites the retina, but what kind of visual information excites the mind? The experiments attempting to answer this question were brutally simple: points of light were flashed onto an animal's retina (a poor cat was usually used) while a galvanic needle recorded cel­lular electricity from a brain region called the V1, which is the first stage of our visual cortex. If some voltage was detected, then the cell was seeing something. Before Hubel and Weisel, scientists assumed that the eye was like a camera, and that the brain's visual field was composed of dots of light, neatly arranged in time and space. Just as a photograph was made up of a quilt of pixels, so must the eye create a two-dimensional representation of reflected light that it seamlessly transmitted to the brain. Yet when scientists tried finding this camera inside the skull, all they found was silence, the electrical stupor of uninterested cells. This was a frustrating paradox. The animal clearly could see, and yet its cells, when isolated with a beam of light, were quiet. It was as if the animal's vision was emerging from a blank canvas. Hubel and Weisel bravely ventured into this mystery. At first, their results only confirmed the impossibility of activating cortical neurons with individual pricks of light. But then, by complete accident, they discovered an excited cell, a neuron interested in the slice of world it had seen. What was this cell responding to? Hubel and Weisel had no idea. The neuron became active at the exact moment it was supposed to be silent, when they were in between experiments. There was no light to excite it. Only after retracing their exact steps did Hubel and Wiesel figure out what had happened. As they had inserted a glass slide into the light projector, they had inadvertently cast "a faint but sharp shadow" onto the cat's retina. It was just a fleeting glint of brightness — a straight line pointed in a single direction — but it was exactly what the cell wanted. Hubel and Wiesel were stunned by their discovery. They had glimpsed the raw material of vision, and it was completely ab­stract. Our brain cells were strange things, fascinated not by dots of light but by angles of lines. These neurons preferred contrast over brightness, edges over curves. In their seminal 1959 paper "Receptive Fields of Single Neurons in the Cat's Striate Cortex," Hubel and Wiesel became the first scientists to describe reality as it appears to the early layers of the visual cortex. This is what the world looks like before it has been seen, when the mind is still creating the sense of sight. Cezanne's paintings echo this secret geometry of lines sensed by the visual cortex. It's as if he broke the brain apart and saw how seeing occurs. Look, for example, at The Rocks Above the Caves at Chateau Noir (1904-1906). 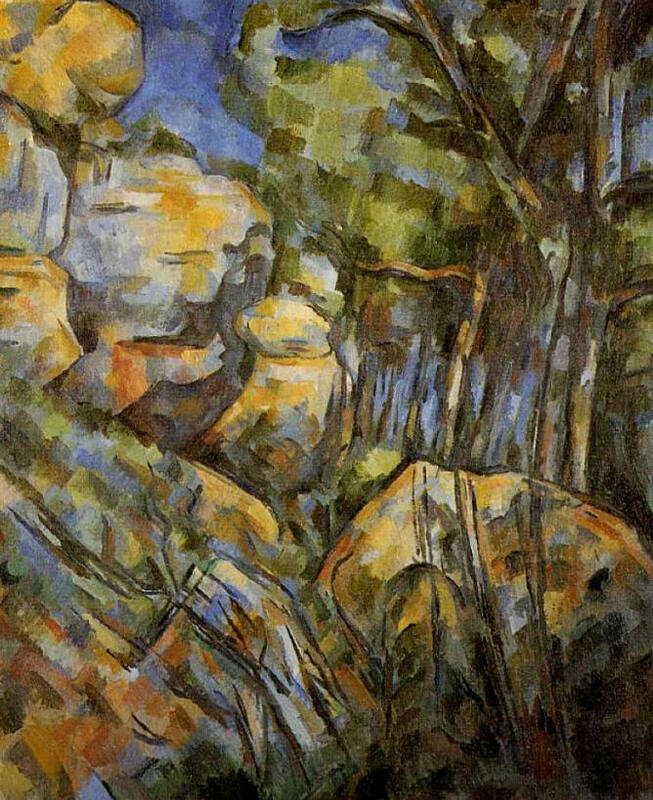 Cezanne has chosen a typically simple subject, just a few boulders surrounded by some scraggly trees. Windows of blue sky break through the foliage. But Cezanne's painting is not about the sky or the rocks or the trees. He has broken each of these elements into their sensory parts, deconstructing the scene in order to show us how the mind reconstructs it. At the literal level of paint, Cezanne represented the landscape as nothing but a quilt of brushstrokes, each one a separate line of color. He abandoned the pointillism of Seurat and Signac, in which everything is dissected into discrete points of light. Instead, Ce­zanne pursued a much more startling path, creating the entire pic­ture out of patches and strokes, les taches and les touches. His impasto paint calls attention to itself, forcing us to see the canvas as a constructive process and not a fixed image. As the art historian Meyer Schapiro noted, in a Cezanne painting "it is as if there is no independent, closed, pre-existing object, given to the painter's eye for representation, but only a multiplicity of successively probed sensations." Instead of giving us a scene of fully realized forms, Cezanne supplies us with layers of suggestive edges, out of which forms slowly unfurl. Our vision is made of lines, and Cezanne has made the lines distressingly visible. This is the abstract reality represented by the neurons of the V1. As the surface of Cezanne's painting testifies, our most elemental level of sensation is replete with contradiction and confusion. The cells of the visual cortex, flooded by rumors of light, see lines extending in every possible direction. Angles intersect, brushstrokes disagree, and surfaces are hopelessly blurred together. The world is still formless, nothing but a collage of chromatic blocks. But this ambiguity is an essential part of the seeing process, as it leaves space for our subjective interpretations. Our human brain is designed so that reality cannot resolve itself. Before we can make sense of Cezanne's abstract landscape, the mind must intervene. So far, the story of sight has been about what we actually sense: the light and lines detected by the retina and early stages of the visual cortex. These are our feed-forward projections. They represent the external world of reflected photons. And while seeing begins with these impressions, it quickly moves beyond their vague suggestions. After all, the practical human brain is not interested in a camera-like truth; it just wants the scene to make sense. From the earliest levels of visual processing in the brain up to the final polished image, coherence and contrast are stressed, often at the expense of accuracy. Neuroscientists now know that what we end up seeing is highly influenced by something called top-down processing, a term that describes the way cortical brain layers project down and influence (corrupt, some might say) our actual sensations. After the inputs of the eye enter the brain, they are immediately sent along two separate pathways, one of which is fast and one of which is slow. The fast pathway quickly transmits a coarse and blurry picture to our pre­frontal cortex, a brain region involved in conscious thought. Meanwhile, the slow pathway takes a meandering route through the visual cortex, which begins meticulously analyzing and refining the lines of light. The slow image arrives in the prefrontal cortex about fifty milliseconds after the fast image. Why does the mind see everything twice? Because our visual cortex needs help. After the prefrontal cortex receives its imprecise picture, the "top" of the brain quickly decides what the "bottom" has seen and begins doctoring the sensory data. Form is imposed onto the formless rubble of the V1; the outside world is forced to conform to our expectations. If these interpretations are removed, our reality becomes unrecognizable. The light just isn't enough. "His [Dr. P's] responses here were very curious. His eyes would dart from one thing to another, picking up tiny features, individual features, as they had done with my face. A striking brightness, a colour, a shape would arrest his attention and elicit comment — but in no case did he get the scene-as-a-whole. He had no sense whatever of a landscape or scene." Dr. P's problem lay in what happened to the light once it traveled beyond his retina. His eyes were fine; they were absorbing photons perfectly. It was only because his brain couldn't interpret his sensations that he saw the world as such a hopeless commotion of fragments. A photograph seemed abstract. He couldn't recognize his own reflection. Sacks describes what happened when Dr. P got up to leave his office: "He [Dr. P] then started to look round for his hat. He reached out his hand, and took hold of his wife's head, tried to lift it off, to put it on. He had apparently mistaken his wife for a hat! His wife looked as if she was used to such things." Sacks' tragicomic vignette exposes an essential element of the seeing process. One of the functions of top-down processing is object recognition. The instructions of the prefrontal cortex allow us to assimilate the different elements of an object — all those lines and edges seen by the V1 — into a unified concept of the object. This was what Dr. P couldn't do. His impressions of light never congealed into a thing. As a result, before Dr. P could "see" a glove, or his left foot, or his wife, he had to painstakingly decipher his own sensations. Every form needed to be methodically analyzed, as if it were being seen for the first time. For example, when Dr. P was given a rose, he described his conscious thought process to Sacks: "It looks about six inches in length. A convoluted red form with a linear green attachment." But these accurate details never triggered the idea of a rose. Dr. P had to smell the flower before he could identify its form. As Sacks put it, "Dr. P saw nothing as familiar. Visually, he was lost in a world of lifeless abstractions." To look at a Cezanne painting is to become acutely aware of what Dr. P is missing. Staring at his postimpressionist art, we feel our top-down process at work. It is because Cezanne knew that the impression was not enough — that the mind must complete the impression — that he created a style both more abstract and more truthful than the impressionists. And even though his postimpres­sionist style was seen as needlessly radical — Manet referred to him as "the bricklayer who paints with a trowel" — it wasn't. Cezanne abstracted on nature because he realized that everything we see is an abstraction. Before we can make sense of our sensations, we have to impress our illusions upon them. In his art, Cezanne made this mental process self-evident. While he deconstructed his paintings until they were on the verge of unraveling, his paintings don't unravel, and that is their secret. Instead, they tremble on the edge of existence, full of fractures and fissures that have to be figured out. Such an exquisite balancing act isn't easy. Until Cezanne sold a canvas — and he rarely sold any­thing — he continued to edit his brushstrokes, trying to edge closer to the delicate reality he wanted to describe. His work would become thick with paint, with layer after layer of carefully applied color. Then the paint would crack, broken by its own mass. Why was painting such a struggle for Cezanne? Because he knew that a single false brushstroke could ruin his canvas. Unlike the impressionists, who wanted their paintings to reflect the casual atmospherics of being en plein air, Cezanne's art was adamantly difficult. In his clenched canvases, he wanted to give the brain just enough to decipher, and not a brushstroke more. If his representations were too accurate or too abstract, everything fell apart. The mind would not be forced to enter the work of art. His lines would have no meaning. The year was 1858. Cezanne was eighteen. His best friend, Emile Zola, had just left for Paris, leaving him behind in Aix-en-Provence. Zola had already decided to become a writer, but Cezanne, following the demands of his authoritarian father, was busy failing out of law school. Zola was furious with Cezanne. "Is painting only a whim for you?" he angrily asked. "Is it only a pastime, a subject of conversation? If this is the case, then I understand your conduct: you are right not to make trouble with your family. But if painting is your vocation, then you are an enigma to me, a sphinx, someone impossible and obscure." The very next summer, Cezanne fled to Paris. He had decided to become an artist. Life in the city was difficult. Cezanne was lonely and impoverished. Being a bohemian was overrated. During the day, he sneaked into the Louvre, where he patiently copied works by Titian and Rubens. At night, everyone crowded into the local bar and drunkenly argued about politics and art. Cezanne felt like a failure. His first experiments in abstraction were dismissed as accidental mistakes, the feeble work of a talentless realist. He carted his paintings around the city in a wheelbarrow, but no gallery would accept them. Cezanne's only consolation lay in the culture at large: the stuffy Parisian art world was finally beginning to change. Baudelaire had begun assailing Ingres. Manet was studying Velazquez. The gritty paintings of Gustave Courbet — his mantra was "Let us be true, even if we are ugly" — were slowly gaining respect. By 1863, all of this new "ugliness" could no longer be suppressed. There was simply too much of it. As a result, Emperor Napoleon III decided to exhibit the paintings rejected by the Academy of Fine Arts for their annual art show. 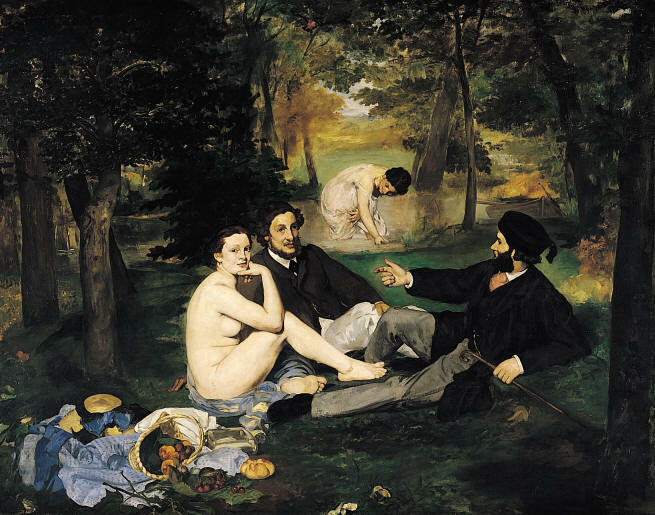 It was in this gallery — the Salon of the Refused — that Cezanne would first glimpse Manet's Le Dejeuner sur I'Herbe (The Luncheon on the Grass), a scandalous picture of a naked woman in a park who doesn't seem to know she's naked. Cezanne was mesmerized. He began a series of paintings in which he reimagined Manet's pornographic picnic. Unlike Manet, who painted the woman with a sense of ironic detachment, Cezanne in­serted himself into the middle of the artwork. His scraggly beard and bald head give him away. The same critics that had been disdainful of Manet were now cruel to Cezanne. "The public sneers at this art," wrote one reviewer. "Mr. Cezanne gives the impression of being a sort of madman who paints in delirium tremens. He must stop painting." Twenty years later, everything had changed. The emperor was gone, defeated in battle during the Franco-Prussian War. Claude Monet, who fled Paris in order to avoid serving in the army, had glimpsed the prophetically abstract watercolors of J.M.W. Turner while in London. He returned to France newly inspired. By 1885, Monet's impressionism was a genuine avant-garde. The painters of hazy light now had their own salons. The intervening years had also been kind to Zola. His Rougon-Macquart novels turned him into a literary celebrity, confidently controversial. He was the proud founder of naturalism, a new school of literature that aspired to write "the scientific novel." The novelist, Zola declared, must literally become a scientist, "employing the experimental method in their study of man." Flush with his success, Zola decided to write a book about a painter. He called it L'Oeuvre (The Masterpiece) because he said he could think of nothing better. As required by his method, Zola based his fiction on a story stolen straight from real life. The life he stole this time was the life of his best friend. After the novel was published, in the spring of 1886, Cezanne and Zola never spoke to each other again. The protagonist of The Masterpiece is Claude Lantier. Like Cezanne, he is a bearded and balding Provencal, a painter whose paintings are too strange to display. Zola even got the afflictions right: both Claude and Paul suffer from incurable eye diseases, are ridiculed by their fathers, and have to trade their paintings for food at the local grocery. While Claude is the stereotypical struggling artist, his best friend, the thinly veiled writer Pierre Sandoz, has achieved great literary acclaim, writing a series of twenty novels documenting "the truth of humanity in miniature." But the real insult came when Zola described Claude's art. His abstract paintings, Zola wrote, were nothing but "wild mental activity . . . the terrible drama of a mind devouring itself." Sandoz's novels, on the other hand, "describe man as he really is." They are a "new literature for the coming century of science." It was clear that Zola had betrayed his impressionist friends. Monet, Pissarro, and the symbolist poet Stephane Mallarme held meetings to denounce the book. "Our enemies," Monet wrote to Zola, "will make use of your book to cudgel us senseless." But Zola didn't care. He had turned against abstraction. If Cezanne's paintings made our subjectivity their subject, Zola's novels were deter­mined to turn man into just another object. The artist, Zola said, must "disappear, and simply show what he has seen. The tender intervention of the writer weakens a novel, and introduces a strange element into the facts which destroys their scientific value." Zola's style didn't last long. His self-proclaimed scientific novels, with their naive faith in heredity and biological determinism, aged ungracefully. His work was not the "immortal encyclopedia of human truths" he had expected it to become. As Oscar Wilde declared, "Zola sits down to give us a picture of the Second Empire. Who cares for the Second Empire now? It is out of date. Life goes faster than Realism." Even worse, the avant-garde that Zola betrayed in The Masterpiece was now ascendant. His movement was being usurped by postimpressionism. By 1900, Zola was forced to admit that he had misjudged Cezanne's abstract art. "I have a better understanding of his painting," Zola confessed, "which eluded me for a long time because I thought it was exaggerated, but actually it is unbelievably sincere and truthful." In the end, it was not The Masterpiece that drove Cezanne and Zola apart. Zola never apologized, but it was just as well: no apology could heal the rift in their philosophies. They were two childhood friends who had come to conflicting conclusions about the nature of reality. If Zola tried to escape himself in his art — fleeing instead into the cold realm of scientific fact — Cezanne sought reality by venturing into himself. He knew that the mind makes the world, just as a painter makes a painting. With that startling revelation, Cezanne invented modernist art. His canvases were deliberately new; he broke the laws of painting in order to reveal the laws of seeing. If he left some details out, it was only to show us what we put in. Within a few decades, of course, Paris would be filled with a new generation of modern painters who liked to break the law even more. The cubists, led by Pablo Picasso and Georges Braque, would take Cezanne's technique to its incongruous conclusion. (Picasso once declared that Cezanne and Buffalo Bill were his two greatest influences.) And even though the cubists liked to joke about anticipating the weird facts of quantum physics, no other painter got the human mind like Cezanne. His abstractions reveal our anatomy. As Cezanne aged, his paintings became filled by more and more naked canvas, what he eloquently called nonfinito. No one had ever done this before. The painting was clearly incomplete. How could it be art? But Cezanne was unfazed by his critics. He knew that his paintings were only literally blank. Their incompleteness was re­ally a metaphor for the process of sight. In these unfinished can­vases, Cezanne was trying to figure out what the brain would finish for him. As a result, his ambiguities are exceedingly deliberate, his vagueness predicated on precision. If Cezanne wanted us to fill in his empty spaces, then he had to get his emptiness exactly right. 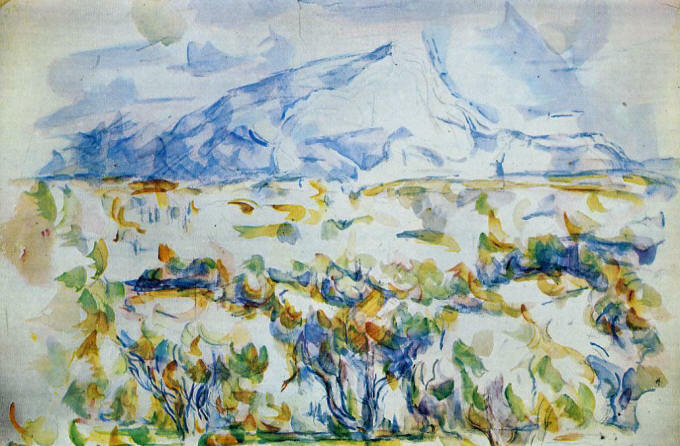 For example, look at Cezanne's watercolors of Mont Sainte-Victoire. In his final years, Cezanne walked every morning to the crest of Les Lauves, where an expansive view of the Provencal plains opened up before him. He would paint in the shade of a linden tree. From there, Cezanne said, he could see the land's hidden patterns, the way the river and vineyards were arranged in overlapping planes. In the background was always the mountain, that jagged isosceles of rock that seemed to connect the dry land with the infinite sky. Cezanne, of course, was not interested in literal portraits of the landscape. In his descriptions of the valley, Cezanne wanted to paint only the essential elements, the necessary skeleton of form. And so he summarized the river in a single swerve of blue. The groves of chestnut trees became little more than dabs of dull green, interrupted occasionally by a subtle stroke of umber. And then there was the mountain. 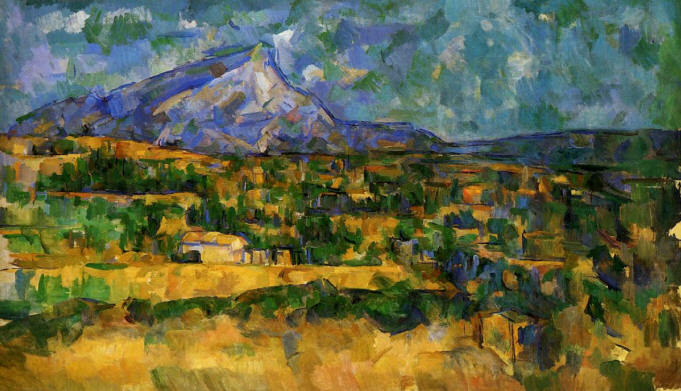 Cezanne often condensed the foreboding mass of Mont Sainte-Victoire into a single line of dilute paint, dragged across the empty sky. This thin gray line — the shadowy sil­houette of the mountain — is completely surrounded by negative space. It is a fragile scratch against the sprawling void. And yet the mountain does not disappear. It is there, an implacable and adamant presence. The mind easily invents the form that Cezanne's paint barely insinuates. Although the mountain is al­most literally invisible — Cezanne has only implied its presence — its looming gravity anchors the painting. We don't know where the painting ends and we begin. Cezanne's embrace of the blank canvas — his decision to let the emptiness show through — was his most radical invention. Unlike the academic style, which worshipped clarity and decorative detail above all, the subject of Cezanne's postimpressionist paintings was their own ambiguity. With their careful confusion of things and nothing, Cezanne's nonfinito paintings question the very essence of form. His incomplete landscapes were proof that even when there was no sensation — the canvas was empty — we could still see. The mountain was still there. When Cezanne began his studies in the blank canvas, science had no way of explaining why the paintings appeared less vacant than they actually were. The very existence of Cezanne's nonfinito style, the fact that the brain could find meaning in nothing, seemed to disprove any theory of mind that reduced our vision to pixels of light. The Gestalt psychologists, of the early twentieth century were the first scientists to confront the illusions of form that Cezanne so eloquently manipulated. Gestalt literally means "form," and that's what interested Gestalt psychologists. Founded by Carl Stumpf, Kurt Koffka, Wolfgang Kohler, and Max Wertheimer in the begin­ning of the twentieth century, the German Gestalt movement began as a rejection of the reductionist psychology of its time, which was still enthralled with the theories of Wilhelm Wundt and his fellow psychophysicists. Wundt had argued that visual perception is ulti­mately reducible to its elemental sensations. The mind, like a mirror, reflected light. But the mind is not a mirror. The Gestaltists set out to prove that the process of seeing alters the world we observe. Like Immanuel Kant, their philosophical precursor, they argued that much of what was thought of as being out there — in our sensations of the outside world — actually came from in here, from inside the mind. ("The imagination," Kant wrote, "is a necessary ingredient of perception itself.") As evidence for their theories of perception, the Gestaltists used optical illusions. These ranged from the illusion of apparent motion in a movie (the film is really a set of static photographs flipped twenty-four times a second) to drawings that seem to oscil­late between two different forms (the classic example is the vase that can also be seen as two faces in silhouette). According to the Gestaltists, these everyday illusions were proof that everything we saw was an illusion. Form is dictated from the top down. Unlike the Wundtians, who began with our sensory fragments, the Gestaltists began with reality as we actually experienced it. Modern neuroscientific studies of the visual cortex have con­firmed the intuitions of Cezanne and the Gestaltists: visual experi­ence transcends visual sensations. Cezanne's mountain arose from the empty canvas because the brain, in a brazen attempt to make sense of the painting, filled in its details. This is a necessary instinct. If the mind didn't impose itself on the eye, then our vision would be full of voids. For example, because there are no light-sensitive cones where the optic nerve connects to the retina, we each have a literal blind spot in the center of the visual field. But we are blind to our own blind spot: our brain unfailingly registers a seamless world. This ability to make sense of our incomplete senses is a result of human cortical anatomy. The visual cortex is divided into distinct areas, neatly numbered 1 through 5. If you trace the echoes of light from the V1, the neural area where information from the retina first appears as a collection of lines, to the V5, you can watch the visual scene acquire its unconscious creativity. Reality is continually re­fined, until the original sensation — that incomplete canvas — is swallowed by our subjectivity. The first area in the visual cortex where neurons respond to both illusory and actual imagery is the V2. It is here that the top part of the mind begins altering the lower levels of sight. As a result, we be­gin to see a mountain where there is only a thin black line. From this point on, we can't separate our own mental inventions from what really exists. The exact same neurons respond when we ac­tually see a mountain and when we just imagine a mountain. There is no such thing as immaculate perception. After being quickly processed by the other areas of the visual cortex — color and motion are now integrated into the picture — the data flows into the medial temporal lobe (also known as V5), the re­gion in the brain that gives rise to conscious perceptions. In this area near the back of the head, small subsets of cells first respond to complex stimuli, such as a Cezanne painting of a mountain, or a real mountain. When these specific neurons light up, all the visual processing is finally finished. The sensation is now ready for con­sciousness. And because neurons in the temporal cortex are very specific in their representations, tiny lesions in this brain region can erase entire categories of form. This syndrome is called visual-object agnosia. Some victims of this syndrome might fail to perceive apples, or faces, or postimpressionist paintings. Even if the victim maintains an awareness of the object's various elements, he or she is unable to bind those fragments into a coherent representation. The point is that our world of form only exists at this late stage of neural pro­cessing, in cranial folds far removed from the honest light of the outside world. Furthermore, the nerves that feed into consciousness are them­selves modulated by consciousness. Once the prefrontal cortex thinks it has seen a mountain, it starts adjusting its own inputs, imagining a form in the blank canvas. (To paraphrase Paul Simon, "A man sees what he wants to see, and disregards the rest.") In fact, in the lateral geniculate nucleus (LGN), the thick nerve that connects the eyeball to the brain, ten times more fibers project from the cortex to the eye than from the eye to the cortex. We make our eyes lie. As William James wrote in Pragmatism: "A sensation is rather like a client who has given his case to a lawyer and then has passively to listen in the courtroom to whatever account of his affairs the lawyer finds it most expedient to give." What is the moral of all these anatomy lessons? The mind is not a camera. As Cezanne understood, seeing is imagining. The problem is that there is no way to quantify what we think we see. Each of us is locked inside our own peculiar vision. If we removed our self-consciousness from the world, if we saw with the impersonal honesty of our eyeballs, then we would see nothing but lonely points of light, glittering in a formless space. There would be no mountain. The canvas would simply be empty. The postimpressionist movement begun by Cezanne was the first style to make our dishonest subjectivity its subject. His paintings are criticisms of paintings: they call attention to their own un-real-ity. A Cezanne painting admits that the landscape is made of nega­tive space, and that the bowl of fruit is a collection of brushstrokes. Everything has been bent to fit the canvas. Three dimensions have been flattened into two, light has been exchanged for paint, the whole scene has been knowingly composed. Art, Cezanne reminds us, is surrounded by artifice. The shocking fact is that sight is like art. What we see is not real. It has been bent to fit our canvas, which is the brain. When we open our eyes, we enter into an illusory world, a scene broken apart by the retina and re-created by the cortex. Just as a painter interprets a picture, we interpret our sensations. But no matter how precise our neuronal maps become, they will never solve the question of what we actually see, for sight is a private phenomenon. The visual expe­rience transcends the pixels of the retina and the fragmentary lines of the visual cortex. It is art, and not science, that is the means by which we express what we see on the inside. The painting, in this respect, is closest to reality. It is what gets us nearest to experience. When we stare at Cezanne's apples, we are inside his head. By trying to represent his own mental representations, Cezanne showed art how to transcend the myth of realism. As Rainer Maria Rilke wrote, "Cezanne made the fruit so real that it ceased to be edible altogether, that's how thing like and real they became, how simply indestructible in their stubborn thereness." The apples have become what they have al­ways been: a painting created by the mind, a vision so abstract it seems real. The stylistic innovations of the impressionists also depended on developments in paint technology. For example, the cobalt violet that Monet often used to paint the ocean and sky had been invented just a few years earlier by industrial chemists. Monet quickly realized that this new pigment had enormous potential for describing the effects of light. "I have finally discovered the color of the atmosphere," Monet declared. "It is violet." Emile Bernard, a French painter, was one of the few people to actually observe Cezanne's painting technique. As he watched Cezanne construct his canvases, Bernard was struck by how Cezanne had broken entirely with the rules of impressionism: "His method was not at all like that... Cezanne only interpreted what he saw, he did not try to copy it. His vision was centered much more in his brain, than in his eye" (Doran, p. 60). The electrical message of photoreceptors is actually the absence of an electrical message, as the photons cause the sodium ion channels inside our photoreceptors to close, which causes the cell to become hyperpolarized. Eyes speak with silence. The early parts of our visual cortex are stimulated by visual inputs that look very similar to a Piet Mondrian painting. Mondrian, a painter extremely influenced by Cezanne, spent his life searching for what he called "the constant truths concerning forms." He eventually settled on the straight line as the essence of his art. He was right, at least from the perspective of the V1. As Gertrude Stein said of one of these Cezanne landscapes, "Finished or unfinished, it always was what looked like the very essence of an oil painting, because everything was there."